Download the zip file of source code. The zip file contains all PHP files necessary to manage events online. This PHP code is not aupported, and is provided free of charge as an example of how to manage events online. It is complete PHP event management system for use with the Scriptcalendar. You are free to modify this code. This code uses an xml file as the database. It is possible to use a MySql as the database, but it is difficult to incorporate into a zip file of example code. For that reason, an xml file is used at the database. That file is the "scevent.xml". 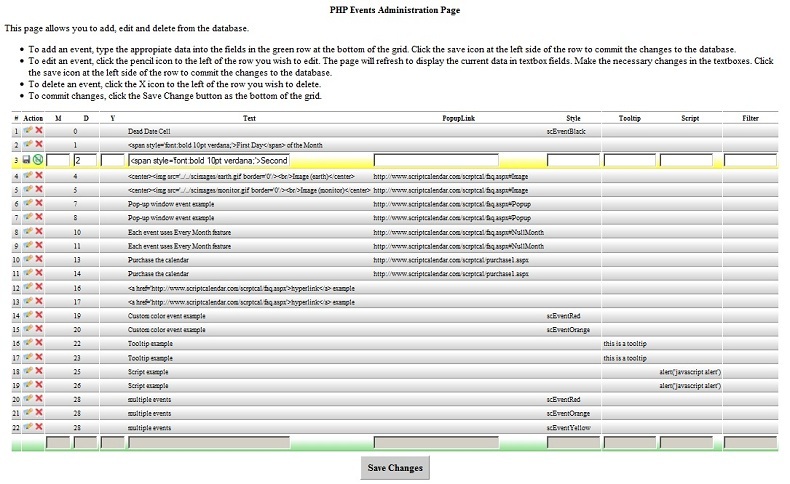 The first page is the "ManageEvents.php". This page will load events from the scevent.xml and display in a table format. The page allows you to add, edit and delete events from the scevent.xml. When you are done managing your events, click the "save Changes" button to save the new version of the scevent.xml on the server. Please note: if multiple users access the ManageEvents.php at the same time, it is possible for them to overwrite each others changes in the scevent.xml. It is recommended that only one user access the ManageEvents.php at a time. If you plan on having multiple concurrent users access the page, you will most likely need to use a MySql database. You could alter the page to read from the database and commit changes with every action, so that each concurrent user constantly sees updates from other users. Download the PHP source code zip file.